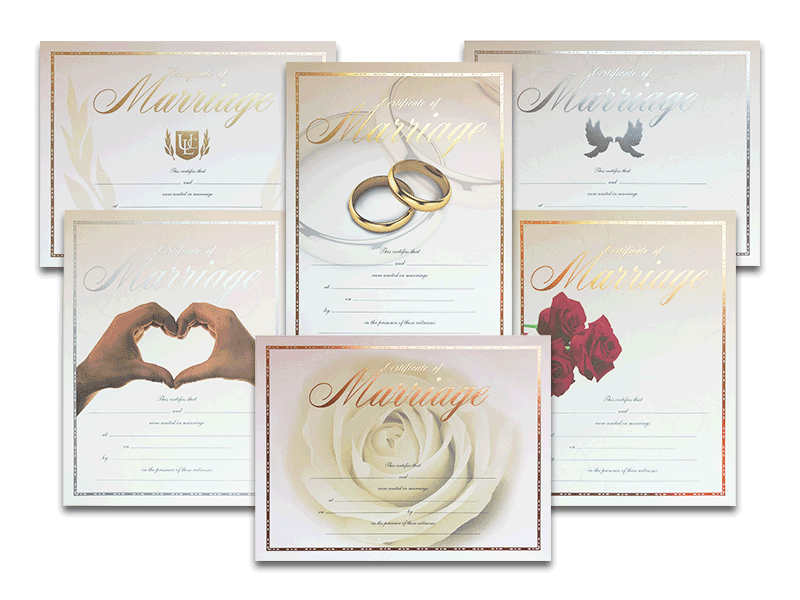 Specialty foiled, 8.5 x 11 Premium Marriage Certificates offered six different custom designs. Makes a perfect gift from the minister to the couple. Offered in six distinct different premium styles to chose from, these commemorative marriage certificate make the perfect gift for wedding couples. Weddings are some of the most important events in our lives, and the license issued by the state is often not of quality that people would like to display. These six custom certificate designs are only offered by the Universal Life Church, and there is a style sure to please any couple. This quality paper is accentuated by either gold, silver, or bronze foiling with two designs in each foil color. The gold foil is available on either the shining wedding rings, or the Classic ULC shield. The silver foil is available in the hand-heart or the two facing doves design, and the bronze is featured on both of our red rose and single yellow rose certificate. This thick 8.5"x 11" certificate paper has a fine finish to the surface so you can easily have it hand lettered in any style that you prefer. Offered with discounted pricing in higher quantities.